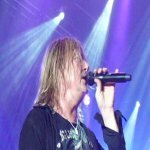 Def Leppard singer Joe Elliott was interviewed by The Star to promote the Down 'n' Outz and talked about 2015 UK shows. Joe talked about the Down 'n' Outz, the city of Sheffield, Mott The Hoople, The Quireboys, the 2015 studio album and playing a home town show with Def Leppard in 2015. The last mention of UK shows by Joe was in November. He suggested then the tour would not happen before September 2015. "When Leppard are on tour, the one gig where your shackles are off is Sheffield Arena, because it's our hometown." "We're in the middle of a new album," he says. "I am recording my part, just taking a break at the moment and then we'll get back together in January." "Then we're out on the road starting in April. There will be a UK tour and the Leppard will play in Sheffield, because we always do - that's the one we want to do."